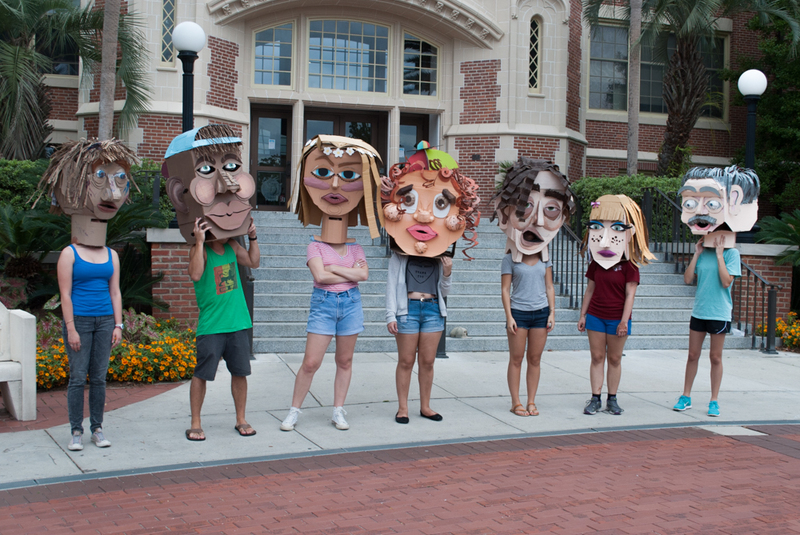 On October 13, 2014 students from the Department of Art‘s 3-D Foundations class taught by Anne Stagg met in front of the Westcott building for a cardboard head demonstration. 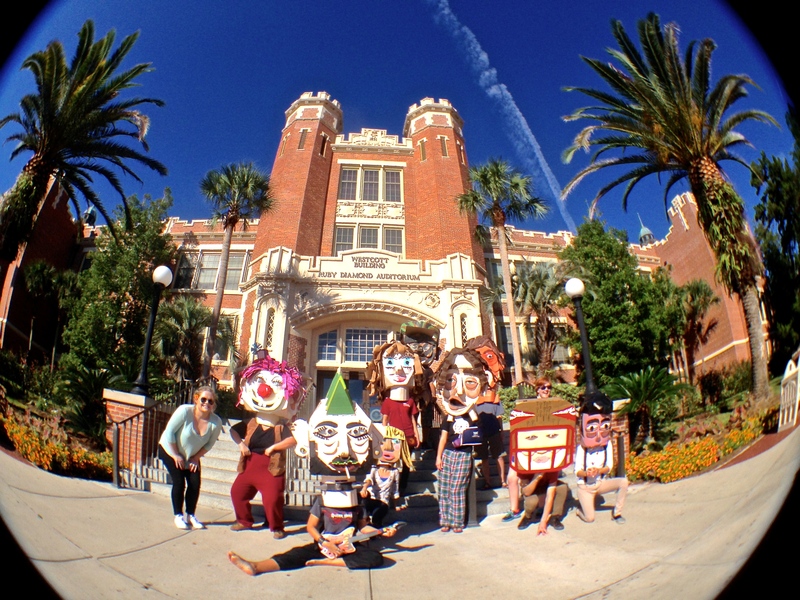 Students collaborated to create cardboard cutouts of heads, each debuting a unique face meant to capture the diversity at Florida State University. Their performances consisted of the students wearing the cardboard heads while a pre-recorded message played in the background. The background audio was a composite piece comprised of excerpts from the 23 student’s individual letters written directly to incoming FSU President, John E. Thrasher. Letters addressed topics beginning with congratulatory remarks to Mr. Thrasher, and moving onto pressing questions the people at Florida State may be wondering. Specific to the arts, items such as budgetary restrictions and the lack of art awareness, in comparison to athletics, were pointed out. Additionally, broader concerns were brought to light. Topics such as safety in regards to sexual assault, issues with the new push for online learning, bettering the surrounding Tallahassee community and increasing support of faculty and graduate students were all addressed. We are innovators. We are collaborators. 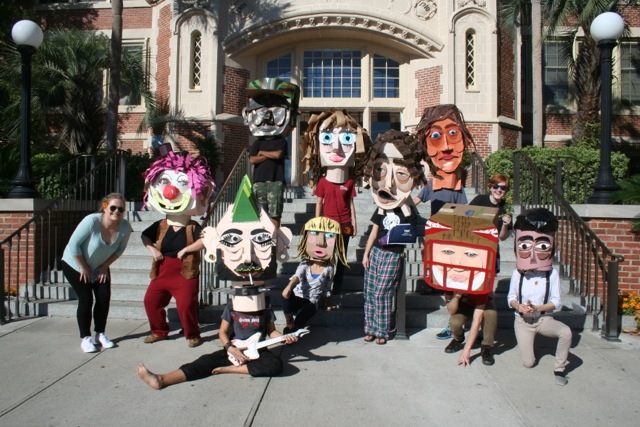 If you were unable to view their performance and would like to see the cardboard heads in action, watch this short video of the “Harlem Shake,” composed by Sammantha Marie and her classmates. Sammantha Marie made this Cardboard Head Harlem Shake video with her fellow classmates in Anne Stagg’s 3D Foundations class. She has always wanted to create an epic “Harlem Shake” video and after watching several different videos go viral over the years she finally had her chance. 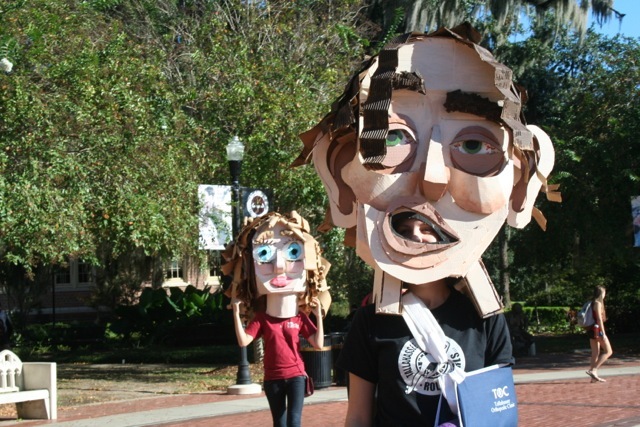 Anne Stagg’s 3D class created these cardboard heads that were based on typical stereotypes of Florida State students. 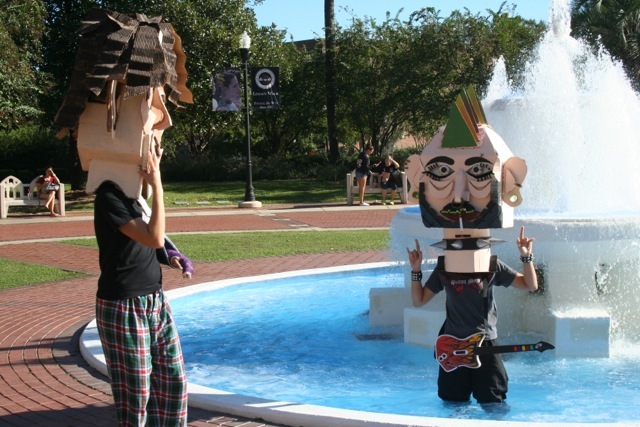 Sammantha Marie and her classmates performed as their cardboard characters at the Westcott Fountain on October 13th. Sammantha Marie believed that making this video, as a class was a perfect way to celebrate their success, while also getting a good laugh out of it.